Harjeet graduated from the University of Sheffield with a Bachelor of Laws (Honours) in 2014. She completed her Practice Training under Mr. Edmond Pereira and was admitted as an Advocate and Solicitor of the Supreme Court of Singapore in 2016. Harjeet assists in a broad spectrum of criminal defence matters which include drug offences, sexual offences, cheating offences, corruption, voluntarily causing hurt and road traffic offences. 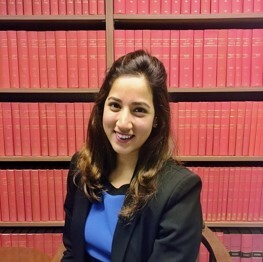 Apart from criminal litigation, Harjeet’s areas of practice include Wills, Probate and Estate Administration, Landlord-Tenant Disputes, Contractual Disputes, Motor Injury Claims, Matrimonial (Divorce) and applications under the Mental Capacity Act. Harjeet has also assisted Mr. Edmond Pereira in a Disciplinary Tribunal Hearing. Harjeet is a volunteer lawyer with the Criminal Legal Aid Scheme (CLAS), a pro bono service set up by the Law Society of Singapore to provide legal assistance to poor and needy accused persons facing non-capital charges.